And all of a sudden I’m in Istanbul! 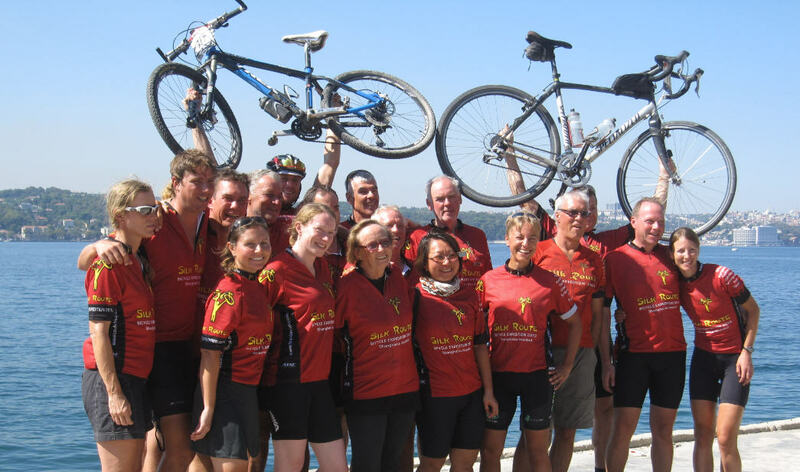 I pedaled almost 12,000 kilometers since leaving Shanghai in May, being 1 of the 5 riders who cycled every fabulous inch! From the terrace of our hotel located on the Anatolian side of the Bosporus, which separates Istanbul in two parts, I am celebrating the end of our trip with my fellow riders and Mariëlla who was waiting for me at the finish line! I am very happy and satisfied. It’s been a beautiful tour with many incredible experiences, great people, wonderful stories, great mountains, deserted deserts and a lot of fun! Pascal, John, Ingrid, Mun Yew, Hannah, Dudley, Chris J, Martin, Bob, Nate and Candice and the others: we had such a good time! Thank you! I’m going to miss you all! And thank you for reading my blog, writing comments and sending me e-mails! Istanbul is within sight as I saw the first road sign yesterday saying only 770 kilometers. And so far cycling through Turkey has been delightful! It’s the last ‘Silk Route country’ for me to cycle through and I enjoy it as much as I can. Although the ‘welcome committee’ in Turkey was quite hostile, the more I cycle to the west the more relaxed the kids and dogs seem to be. The route brings me through remote parts of the country with beautiful views and small villages. Every village has a mosque and where ever there is a mosque there is a usually a place to drink tea! My Turkish is very limited but it happens quite often that I have a conversation about where I’m from and where I’m going. The older men usually understand why I’m cycling; the younger men usually ask why I’m not traveling by car… Having a cup of tea with Hannah or John, somewhere is a small village makes me perfectly happy! An old man brings us an apple and hazelnuts adding to that happy feeling. Just being there and enjoying the moment! I can see that everyone in the group is enjoying our last few kilometers more intense. Partly because Istanbul is within reach, partly because it’s all mountains we cycle through. With days of up to 2.000 meters of climbing at the end of a four month journey, I can feel the tiredness in my legs. But at the same time I have so much energy that I can’t sit still. I’m helping Mun Yew with organizing birthdays: balloons and Bombay toast for John, wine and Turkish cookies for Hannah, beer for Dudley. Not sure if the beer helps me up the mountains, but it seems to have a positive effect for Dudley. Apparently he didn’t mind taking a bath with me on the top of a hill on a hot day… And although temperatures were in the high twenties, it was clearly getting autumn. Leafs were falling down the trees and the smell when cycling through the forest is typical for the time of the year. Fog was hanging between the trees as in a Robin Hood movie. In the evening the grass was wet and clothing and sleeping bags became clammy. But the water in the Black Sea was still warm and after the deserts in Iran and Turkmenistan, a swim was a real treatment! Along the way we passed the towns of Amasya, Safranbolu and Şile. Great places for a good meal, a glass of wine, a walk through narrow alleys, a cup of tea or a visit to an old castle. One of the most interesting archeological sites I visited was the ancient city of Ani. 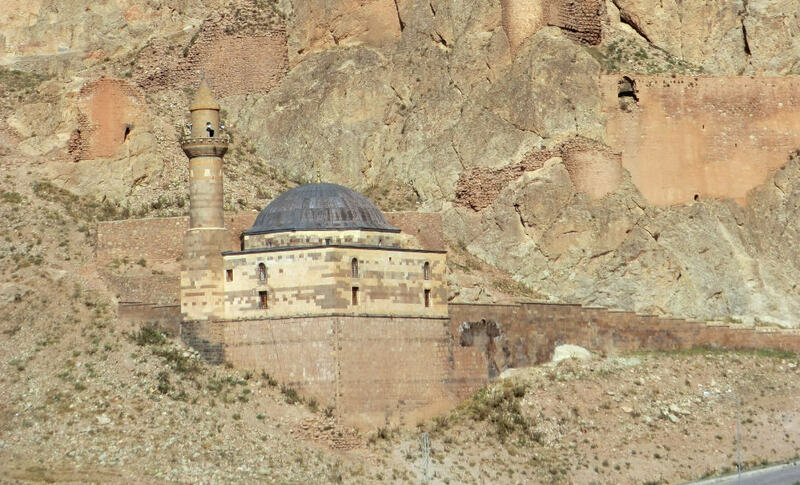 It’s one of the most important Silk Road cities of the Middle Ages and there are still traces of the Silk Road visible! 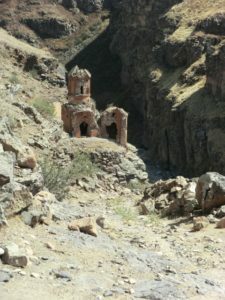 The photo on the left shows the ancient road into the town coming from Armenia. Camel caravans have been walking over this road centuries ago! Despite several earthquakes, a few churches and city walls have survived more or less; thousands of stones give an impression of how big this city must have been. Traveling this ancient road not only shows me the past, it also shows me the wonderful people still living along this road. And it’s great to share this experience with my fellow riders. Istanbul is getting closer and I know already that it would be difficult to say goodbye to fellow riders and traveling. 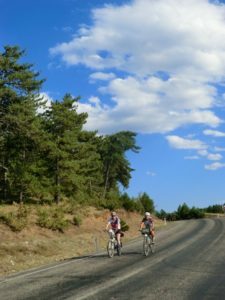 But there are still a few hundred kilometers to cycle over these small back roads in Turkey! Well… things in life can change quickly. Especially when you’re on a bicycle expedition, traveling from Iran to Turkey. Military and kids make a difference! After a great cycling day through a landscape full of mountains I reached camp after approximately 140 kilometer. Camp was a little bit further than planned because the initial camp side turned out not to be suitable. So we ended up on a nice piece of flat land, 25 kilometer before the border crossing and a kilometer from the high way. Nice, quiet, and with good views on mountains and farming land. No one around except a shepherd walking around with his cows. During dinner a couple of cars pulled up. Military men in green army suits, a few police agents and a couple in normal clothing started a discussion with Ali, our local guide. He speaks Farsi and knows how to talk to government officials. Apparently, we were camping next to a gas pipe. This gas pipe has exploded whatever kilometers further and there might be a possibility that it would explode on this specific place again. The government officials were very much concerned that if it would explode, the newspapers would report that the Iranians had bombed so tourist, among them some US citizens. I am not making this story up! Relaxed as we were most of us went to bed around 21:00 hours. Until our tour leader woke us at 23:30 hours. 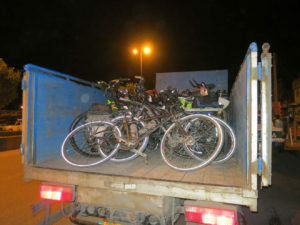 The military and/or police had arranged a hotel in town, a passenger bus and a truck for our bicycles! The hotel was next to the border crossing and from the border it was only 25 kilometers to out camp site. From the road I could see Mount Ararat clearly. 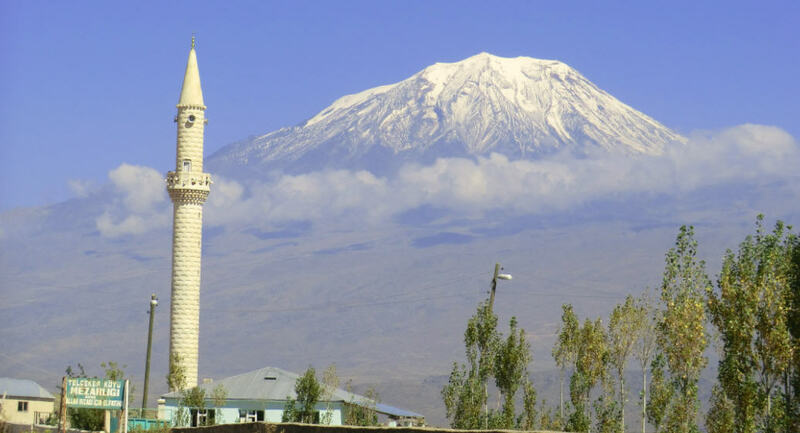 According to the book of Genesis, Mount Ararat is where Noah’s ark came ashore. The border crossing went quickly. Leaving Iran was no issue and on the Turkish side I had to purchase a Turkish visa for 20 US Dollar. The visa was basically a sticker and stamp in my passport, but I didn’t want to cycle back to Shanghai… well… maybe I could… Anyway, the 250 meter border crossing makes such a difference. Once I was cycling in Turkey the road was basically an airplane start/landing runway. Smooth and wide asphalt! I was cycling with Ross and Dudley was approximately 1 kilometer behind us. One of the two boys in front of us crossed the road; the other stood still in the middle of the road. Just like in Iran I was happy to see some kids because it’s always fun to have a chat with them. I slowed down a bit to say hello. When Ross, cycling now in front of me, passed the first kid he warned me that the kid on the right had a stick. One second later kid number 1 threw the stick into my wheel while the other threw a stone in my stomach. I stopped quickly, dropped my bicycle on the asphalt and started to run after the kids. I saw Dudley behind me do the same. After 10 meters I felt pain in my hamstring! Not good… I more or less collapsed from the pain and stopped the chase. I was angry, surprised, frustrated and confused at the same time. How could this happen? Since Shanghai I had met only friendly people! Where did this came from? What did I do wrong? The pain was severe and I was happy camp was only 20 kilometers away. This was certainly unexpected! In camp, Haldun, our local guide in Turkey, managed to get some ice for my leg. I was still angry, surprised, frustrated and confused. In the next couple of days I understood this part of Turkey a little bit better. Stones and sticks are used by many people to manage sheep, cows and dogs. It’s what the kids learn from their parents. And it’s the only ‘tools’ they have to be naughty. In addition, this is a really poor region. Apparently, tourist are an easy ‘target’. The more we cycle to the west, the less irritating the kids seem to be. I got some cream from Haldun and some patches from Mun Yew and got rid of the pain in 5 days or so. Cycling of course continued! Istanbul is close! I wonder what unexpected things I can expect more?!?! Enjoying a tailwind and a bit of sun!